Beautiful, first-floor, beachfront condominium.. Master bedroom king bed, pull out couch in living room. Panoramic view over miles of beach and water from the deck. Pelicans plunge, dolphins frolic, and shrimp boats and sail boats glide by. Thirty steps from the beach. Twenty-five miles to historic Charleston with fascinating tours, superb dining, cultural events, museums, children's activities... sightseeing to plantations and nature centers. Seabrook is a quiet, residential island with tropical vegetation and abundant wildlife including herons and egrets. Twenty-four-hour security gate. Lake House Pool, fitness center, fishing, and boating nearby. Wifi. No pets. No smoking. I made a number of upgrades this winter: TV (smart one), VCR, lamps in living room, rug in living room, porch furniture, dining room table and chairs, bar stools, lamps in bedroom, recessed lighting in bathroom and kitchen, artwork and mirrors, paint. Lovingly furnished by owner who occupies condo from November - May and asks renters to treat her condo gently. Our family of 4 had a great time on Seabrook and enjoyed our stay in this nice villa. It was very clean, well located, and had direct beach access. We have rented other properties that offer the beach club amenity card, and we would have liked to have the beach club access, but, in the end, we didn’t miss it that much. The lake house pool is nice and much less crowded. We would recommend this property. Our very first VRBO stay will not be our last! We enjoyed the relaxing beachfront condo from the bird watching to the dolphins swimming! The drive into Seabrook is picturesque!! I would highly recommend this to family and friends!! Awesome location close to beach access. Condo was very nice and had everything you would possibly need. Beautiful views from the back deck. Lovely quiet getaway, gorgeous view. Very comfortable. Need to upgrade bathroom fans and it will be nearly perfect. Thank you for your review. I'm glad you enjoyed your stay. I will replace the fans this winter when I'm down there making some improvements. I think it is a good idea. I try and make a few improvements ever year and I always appreciate hearing form renters on what they find important. Everything was great. The only issue was the noise from the second floor every morning. They had four kids that were up at 7a.m. running on the hardwoods until we finally got out of the bed. Other than that it was awesome. Thank you for your review. I’m glad you enjoyed your stay. There is supposed to be a runner in the hall upstairs. Sometimes people roll it up for some reason. It helps when it’s down. I actually went upstairs once when I was staying there and asked renters to roll it back down. I travel a lot and a trick I use it to run the AC fan on constant. It really helps to create white noise. I will discuss it again with the owners of the upper unit. Maybe they can leave a note for renters. Our stay at Seabrook Island was one of my favorite vacations to date! There was plenty to do and in close proximity to the beach. The villa was nice but could use some updating however, we aren't there for the house! The beach access was great and we loved seeing a few critters from our patio. Each night we drove/walked the island and saw many animals! We hope to visit again, thank you Peter! 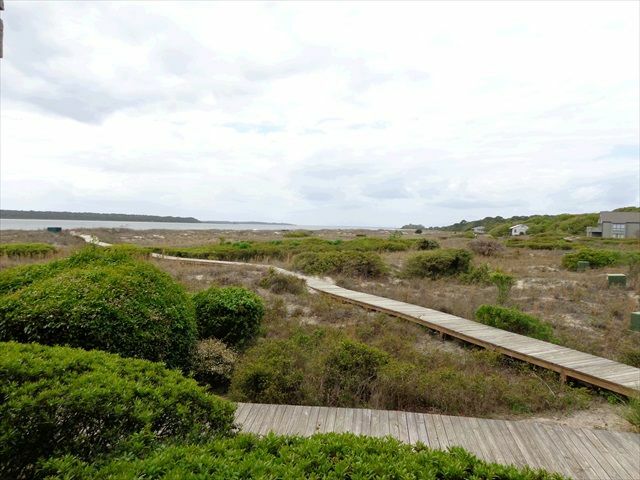 Watch deer browsing in the dunes as you relax on the deck.